Released this week, the 2019 report ranked American Aero in the top 5 percent of FBOs worldwide for the second consecutive year. In this year’s survey, American Aero was also rated the #1 FBO in Texas and one of the five best FBOs around the globe. American Aero received the industry’s highest accolades for service, facilities, and amenities, moving from a tenth-place showing in the world last year to a second-place spot in 2019. 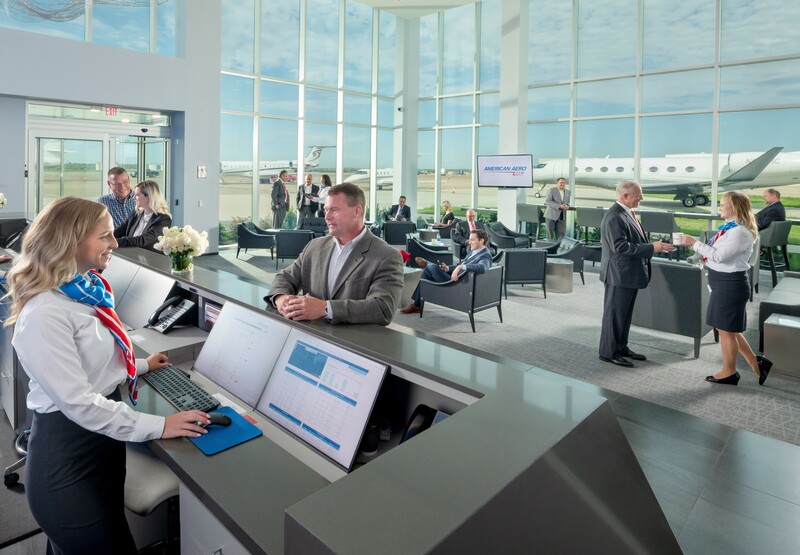 The survey includes 4,500 FBOs, and results are based on reviews by passengers, pilots, flight crews, and dispatchers, who are asked to evaluate FBOs in five categories—pilot amenities, passenger amenities, customer service representatives, line service, and facilities. The 2019 survey also recognized American Aero team member Kirsti Hunsley in the “Above and Beyond” category as one of the top customer service representatives in the world, based on customer survey comments. Hunsley has been with American Aero since June 2015. AIN is a prominent and most relied upon industry publication that covers all aspects of aviation, including business, military, and transport. Its annual survey report has been produced since 1981 and offers an independent, online evaluation of FBOs worldwide. In 2018, American Aero became the first FBO in the world to earn the International Standard for Business Aircraft Handling (IS-BAH) Stage 3 certification for advanced ground handling safety. The FBO recently earned DCA Access Standard Security Program (DASSP) clearance as an approved gateway for travelers to and from Ronald Reagan Washington National Airport. American Aero also offers on-site U.S. Customs services. American Aero FTW is a private aviation terminal located at Meacham International Airport (KFTW) in Fort Worth, Texas. The fixed-base operator (FBO) is focused on the refueling, ground handling, servicing, and storing of business and private aviation aircraft and provides extensive crew and passenger amenities. In 2015, American Aero FTW became the first FBO in the Western Hemisphere to achieve the International Standard for Business Aircraft Handling (IS-BAH) from the International Business Aviation Council (IBAC); it was one of the first in the world to earn Stage 2 registration in 2017 and became first in the world to be awarded Stage 3 registration in 2018. American Aero FTW offers 280,000 square feet of leasable hangar and office space and is the primary tenant and only FBO in the airport’s main administration building. American Aero FTW offers AvFuel Rewards and is a Signature Select™ affiliated FBO, providing Signature TailWins® points, Signature Status® benefits, and the benefits of the Signature Flight Support network. American Aero FTW ranked the #1 FBO in Dallas-Fort Worth and among the top 5 percent of FBOs in the world in the 2018 AIN FBO survey. More information can be found at www.americanaero.com.